Francine has a home! 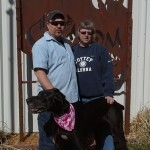 - Rocky Mountain Great Dane Rescue, Inc.
Francine has a home with her foster family in Alliance, NE. Wayne & Tracy have been waiting to fill their home with another Great Dane for some time now. When they decided to foster Francine they soon realized that this sweet girl was special and that she needed some extra attention and help with some of her separation behaviors….All of which they are dedicated to help her with. Fortunately for all involved, Francine is able to be with Wayne & Tracy 95% of the day! This lucky girl gets to go to work and always be with her humans. Wayne and Tracy have affectionately renamed her “Frankee” Way to go sweet girl!